Information: Please see the VIC Calendar of openings here for details of facilities at each garden. Over one special weekend, Open Gardens will be opening six productive gardens across Melbourne. From a community garden to permaculture and potager gardens: this is a must visit for those interested in growing productive gardens or gaining new insights into how these gardens can be successfully cultivated in urban spaces. There will be a range of extra activities including wicking bed demonstrations, workshops on growing Asian vegetables, talks on permaculture gardening, garden produce and specially handcrafted garden products for sale. A tranquil and quirky community garden hidden in the heart of busy Coburg. Built on old tennis courts, it is divided into many different spaces, all containing edible produce of some sort: indigenous/native, ornamental, a large school kitchen garden, chickens, berry garden and espaliered fruit. Clever design integrates a beautiful French-style potager with spaces for living and entertaining. There's a formal geometric vegetable garden, pergola, hazelnut hedge, and garden beds surrounded by woven hurdles. Espaliered heritage apples, French pears, greengage, cherry trees and damson plum are underplanted with edible plants. A living example of the principles of permaculture gardening. Many varieties of fruit trees and 23 different types of berries jostle for space among unusual medicinal herbs, edible flowers and perennial root crops. Small ponds with edible water plants and tiny fish. Hydroponic vegetable beds. A delightful permaculture garden surrounding a sustainable house. Intensively worked productive front garden is brimming with fruit trees, vegetables and herbs. There's a rear native garden of wattles, grasses and small ephemeral wetland. Wicking beds, compost, hens, worm farms. Structures made from recycled materials. Tanks and greywater. Over the weekend there will be wicking bed talks and the owner will conduct tours of the garden. plantings. There are vegetables in raised beds and 40 fruit trees - quince, pomegranate, apple, fig, cherry avocado and apricot - keep the family self-sufficient. The garden also features a beehive, heritage chickens and a duck. Set within the heart of the largest public housing estate in Melbourne is a lush urban oasis containing an astonishing array of edible plants with 126 raised plots tended by local residents. The huge range of vegetables includes pumpkins and cucumbers from East Timor, taro, tree lettuce and mustard greens, all grown using organic and sustainable principals. A large pergola with pizza oven and seating is a social centre for gardeners and local residents. Now is the season of abundance as many fruits ripen up for the summer season. 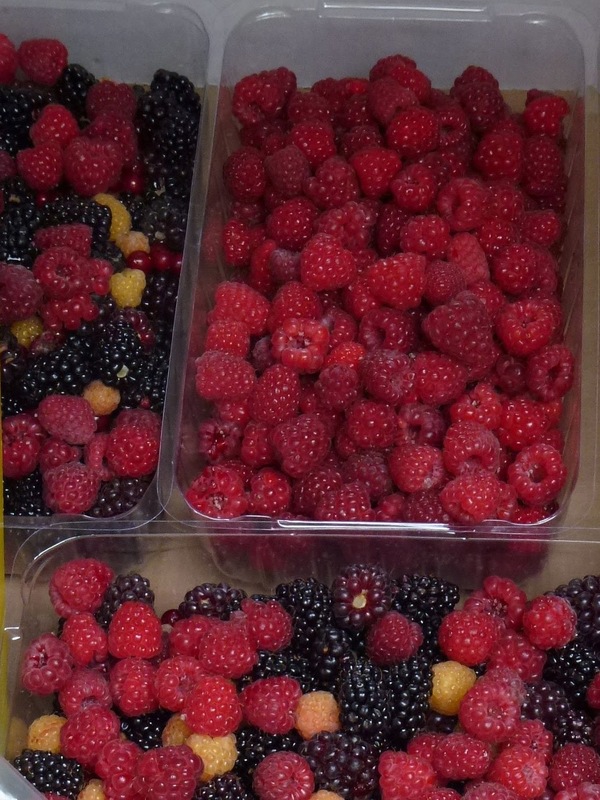 Stone fruits and berries are some of my scrumptious favourites but both of these can be quite expensive to buy organic. Many urban dwellers only have a limited amount of produce we can grow in our own neighbourhoods (although it could be a lot more). One solution I've found is to go to a ‘pick your own’ farm. This way you can still play a part in where your food is coming from and develop an direct relationship with local farms. The wider environmental implications are that fruit is local, seasonal and fresh. By buying direct from farmers and shortening the supply chain, farmers also get more return for their produce. Make sure you take your own containers- choose multiple small ones so as the produce doesn’t get squashed under its own weight. Covered shoes and sun protection are also recommended. If you pick more than you can eat berries freeze well as does stewed stone fruit. Home made jams and chutneys are easy to make and if you fill up recycled jars it also means no packaging. Last year our family picked and made a years supply of jam and it was well worth the effort but beware- once you’ve tasted homemade conserves you’ll never be able to eat bought ones again! We have started a tradition of a yearly trek to Sunny Creek Organic Berry Farm out past Warragul in Victoria, Australia. It is an interesting farm to visit, not just for the diversity of produce, but to see a commercially operating farm that has been designed using permaculture principles. Phil Rowe explains that they use techniques like "Inter-cropping with berries amongst trees and multiple varieties in rows. Extending harvest period through crop choices and tolerance of weeds which are relatively benign to crops, like violets". Chestnut trees, apples and hazelnuts form the tree layer which shelter and add diversity to the main berry crops. Birds and frogs are encouraged as natural pest controllers- but kept away from the berries during the harvest period with nets. 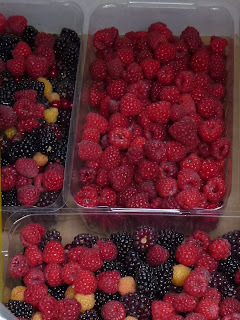 Envisage vines dripping with raspberries, giant blackberries, red currents, juicy boysenberries and rarities such as the delicate velvet of white raspberries… Yum! Sunny Creek also has an aptly named ‘gobblers pass’ for $5 so you can eat as much as you want on farm. While you are there you might also pick up some tips on how to grow your own. Check out these websites for other ‘Pick Your Own’ farm listings- not all are organic but many are. It’s also a good idea to call first to confim what’s in season as it can vary year to year. A years supply of jam from organic handpicked fruit. Welcome in summer at our first Summer Swap and our last swap for 2013 so come on down and exchange your abundant homegrown goodies for other local produce. 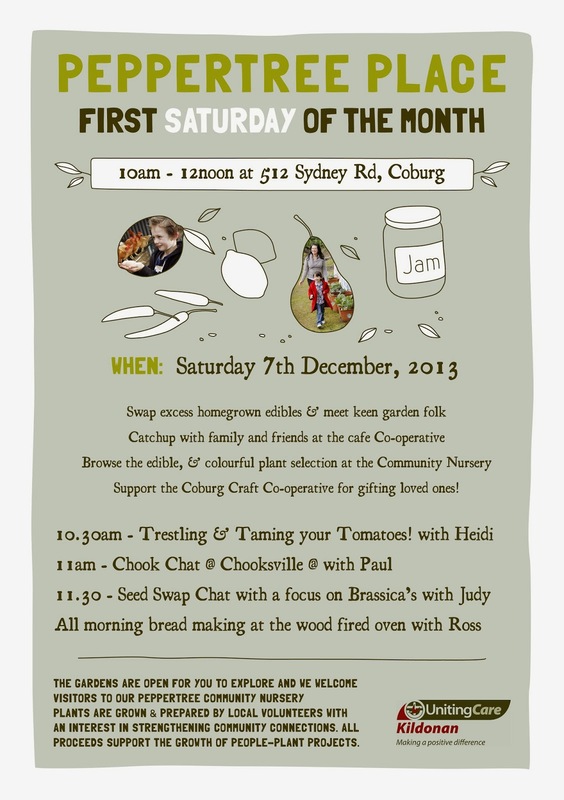 The Coburg Home-Grown Edibles Swap will be bursting with garden greens and spring goodies and whatever the underground larder gives up! Bring along your produce and swap & share backyard bounties with local growers from Moreland and beyond. Seedlings that cry "Healthy Meals Are A'Coming!" will be available from the PepperTree Community Nursery and as always home baked tasty treats and delicious coffee on offer at the Cafe Cooperative. Did you know that bread can sing? It will squeak and whisper as it hits the wide world after baking in the toasty depths of your oven. Bread song is something that makes you stop, breathe in belly warming scents and smile at small wonders. You are invited to join Ross around the woodfired oven this Saturday to chat all things bread baking, listen to bread song and taste-test loaves as fresh as can be. Bring your own creations to the oven by 10:30am and share in the age old tradition of community baking within this inviting community garden.